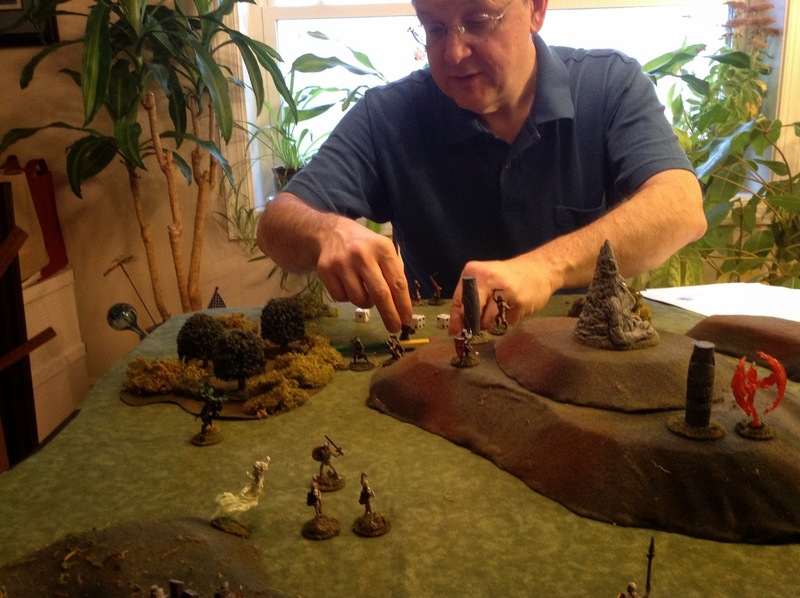 This weekend a bunch of us got together for a comparative play test of three sets of rules for Dark Ages skirmishes. The three sets were Saga, Battle Troll, and Songs of Blades and Heroes. We set up the same scenario on three different boards and ran the scenario with each set of rules three times. The players mostly moved from game to game in order to try the different rules. Because we only had a few people who could GM some of the rules, not everyone had a chance to try all three sets. The scenario involved roughly equal forces. The raiding force was to enter the table, cross the stream at the ford, steal livestock, and exit off the other end of the table. The defending force was to retain control of their livestock and exit the table where the raiding force entered. The two forces had to cross through each other with a bunch of animals, usually cows. There were too many simultaneous games to detail any blow-by-blow coherent battle reports. Instead I will attempt to record the various players’ impressions and comments on the different rules sets. The intent of this report is not vote on which was the best rule set for Dark Ages gaming; rather, the intent is to discuss the strengths and weaknesses of the various rules. Saga: Saga is a tournament-oriented Dark Ages skirmish system. It involved the largest forces of any of the games and resolves combat very quickly. Neither the combat nor activation mechanisms are particularly innovative; however, the use of a “battle board” to customize the various armies. An army might have 30 or more figures. Battle Troll: Battle Troll is focused on recreating man-to-man fights like those of Norse legends. There are three kinds of figures. Heroes are the focus of the game. They have reputation points that are accumulated for heroic actions. Heroes are usually assisted by some number of huskarls and karls. The karls are designed to die in droves, but the effective use of them to assist the heroes and huskarls during a melee can be decisive. In general our impression is that you wouldn’t have a player control more than about ten figures with these rules. Songs of Blades and Heroes: Like Battle Troll, Songs of Blades and Heroes seems best with about 10-15 figures per player. Forces consist of heroes, warriors, and other minions. For this play test, in order to compare apples with apples, we “blandified” the game from its intent by removing all fantasy elements. The combination of attributes enables the most customization of figures and forces and seems to be the most flexible of the rules. This impression is validated by the number of sets of rules in the Songs of… family of rules. Greg rolled a triple one for activation, losing the initiative. Saga: Saga is turn based. One side goes and then the other side goes. There are opportunities to interrupt or affect the other player’s actions. The gimmick in Saga is the battle board, which customizes the various armies by giving them special “tricks” or abilities during the game. At the beginning of a player’s activation, he rolls a certain number of Saga dice and places them on his battle board to be used during the turn to activate units, perform special actions, etc. For instance, the Vikings have an ability to modify the armor value of a unit when attacked by missile weapons. The battle board makes each army feel different, but in turn, success is highly dependent on being able to effectively manipulate the battle board, relegating maneuver on the table to secondary importance. When a unit activates, generally all of the figures in the unit may either fire or move, but not both. A unit may activate more than once in a player’s turn, accruing a fatigue marker as a result. Movement is generally up to six inches. Battle Troll: Forces or sides in Battle Troll are divided into up to four bands, each led by a hero, his huskarls, and karls. Battle Troll uses a card-based activation mechanic with a twist. The twist is that there are two kinds of cards. The first allows everyone in a bad to activate. The second allows a hero and any figures within four inches of him to activate. A figure may move, conduct moving fire with a javelin, fire a bow or other missile weapon, move, or move into contact and conduct hand-to-hand combat. Movement is either at a walk (2d6”) or at a run (3d6”). There is no notion of fatigue. Songs of Blades and Heroes: These rules have the most interesting activation system of the three sets. Each figure may roll 1, 2, or 3 dice for activation, trying to beat its activation number. The player may choose the order in which he attempts to activate his figures. If a player fails two activations, initiative switches to the other player. More than one success on the activation roll allows a figure to perform more than one action, including a “powerful blow,” which can cause more damage. There are nuances and strategy to how many dice you roll and the order in which figures are activated. I’m not sure what exactly this mechanic is simulating, but it is interesting and fun and can cause violent shifts of momentum and swings in the fortunes of battle. Saga: Combat resolution in Saga felt very much like something from Games Workshop. One player rolls to determine hits, and the other side rolls to “save” based on armor. A unit gets to roll a certain number of six-sided dice for combat based on the quality of the troops. Heroes roll five dice. Warriors roll two dice for each figure. Levies roll one die for every three figures. In this sense, it felt a little like the very first release of The Sword and the Flame. As mentioned earlier, a unit’s activity can be modified by “tricks” from the battle board. The combat system was largely unremarkable, but there was one interesting nuance. When an opposing unit has fatigue, a player can spend the enemy’s fatigue to increase his own armor value for that combat. This was an interesting way to have fatigue effect combat. When a figure is hit and does not save, it is killed. Battle Troll: Battle Troll has a really interesting and fun combat mechanism; although, since it is more involved than that of the others, I think it really limits the number of figures a player can handle without bogging down. There are five attack cards and five defense cards, each depicting a different type of attack or defense, such as cut, swing, or jest. Heroes choose a maneuver. Other figures randomly pick one of the five. Then the attack and defense maneuver is revealed. They are cross-indexed on a small chart that results in a number of dice rolled by the attacker and the defender. Some attacks and defenses actually result in the defender getting more dice than the attacker. The number of dice can then be modified if one side outnumbers the other, if one figure’s social status is better than the other, etc. The combatants compare the high die each rolls. If one side’s high die is a four and the other side’s high die is a two, that side wins by two. That difference then modifies the result of a damage roll. A figure can have many wounds before being killed. The effect of wounds is to allow the other player to reroll some number of his attack dice. There is an interesting attack, called a “jest.” When an attacker jests and the defender chooses certain defensive maneuvers, the defender can lose reputation points. Songs of Blades and Heroes: Combat in Songs of Blades and Heroes uses opposed die rolls. Each figure has a combat value that is added to the roll on a six-sided die. These die rolls are modified by having extra combatants, special abilities, or terrain. The highest roll wins. If the high roll is even, the loser is forced back a short distance. If the high roll is odd, the loser is knocked down. If the high roll is double opponent’s roll, the loser is killed. A high roll that is triple that of the defender indicates a gruesome kill, and models nearby must take morale test. Saga: Even though the rules were the most complex of the ones we tried, the Quick Start sheets were great, and variables were limited. Most players found themselves not needing the GM’s assistance after maybe 3 turns. The players liked the interesting game mechanic of the battle boards (described later) and the individuality between the armies. The rules had great period feel and were the quickest pace. Of the rules we tried, these were by far the most expensive, particularly if you want the special six-sided dice. The battle boards were difficult to master. Saga had the most mainstream feel of the lot, not quite Games Workshop, but a player can exploit rules to “math-hammer” their less experienced opponent. Battle Troll: Several players felt that Battle Troll was the lightest hearted and creative set of rules. It is a fun and creative set of rules. The notion of social classes and reputation is interesting and provides a somewhat different twist from a straight up battle game. The rules are based on Viking vs. Viking lore, so the sides were very similar and didn’t provide much variation. There are a number of charts and variation and optional rules for handling karls. Many players found themselves paging through the book and referring to the charts frequently, but others found the rules easy to learn. Songs of Blades and Heroes: Of the rules we tried these were the least expensive and required the fewest figures to get started. They were easily learned and highly customizable. 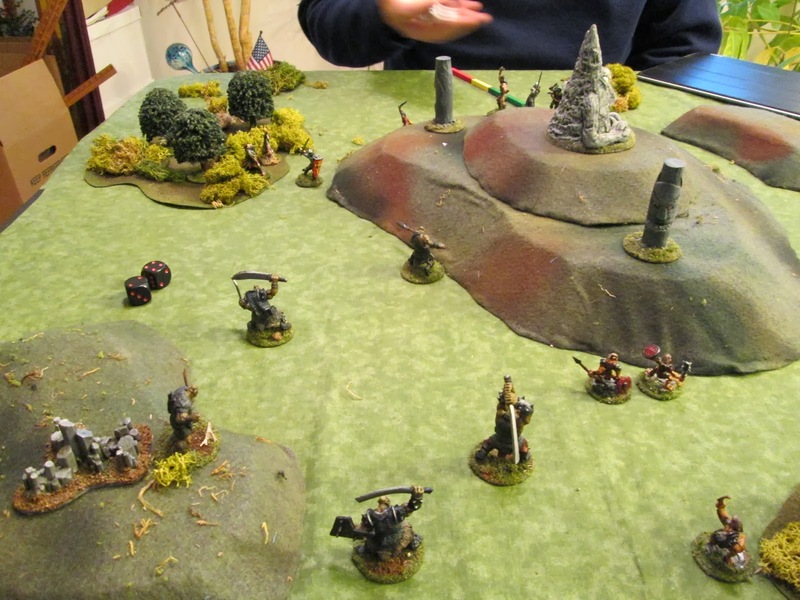 While individuals were customizable, the players felt that the rules provided little individuality or flavor between the armies. Also, there was a feeling that there wasn’t much difference between armored and unarmored troops. My personal impression is that for a game using just a few figures per side, I think I’d like to use the Songs of Blades and Heroes activation mechanism with the Battle Troll combat resolution mechanism. I found the Songs of Blades and Heroes activation mechanism to be unique, fun, and dramatic. I found the paper/scissors/rock aspect of comparing attacks and defenses in the Battle Troll combat resolution to feel like fighting with swords and shields. Chris Palmer This past Saturday I went to Rob Dean’s house for a couple games of “Song and Blades and Heroes”. Rob and I decided to hold these game days using SoBaH to give us an opportunity to use our newly painted Bones figures. Like me, he bought into the first Reaper Kickstarter, and has been busy working on painting the figures from it. 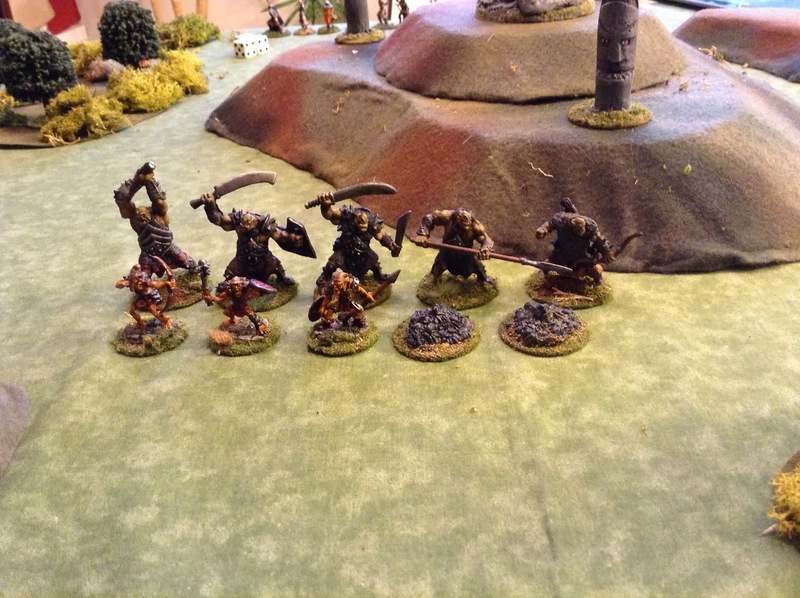 He has also purchased and painted a number of Reaper’s non-Kickstarter Bones figures as well. Rob set up a nice looking table with some sort of ancient stone heads guarding a hilltop. Perhaps some ancient burial ground I was guarding from treasure hunters? For our first game I decided to build a warband around some of my newly painted translucents. So I decided on a force consisting of: 1 Spectre, 1 Ghost, 2 Superior Skeleton Archers, 1 Skeleton Warrior, 1 Superior Skeleton Warrior (I used the Lionman skeleton stats from the rulebook), and 1 Fire Elemental. This gave me a group of rather mediocre troops, most having a Combat score of 2, and Qualities of 3+ and 4+. My best weapons were the Spectre with its Terror attribute and the Fire Elemental with it’s 4+ Combat score, and short range shoot. 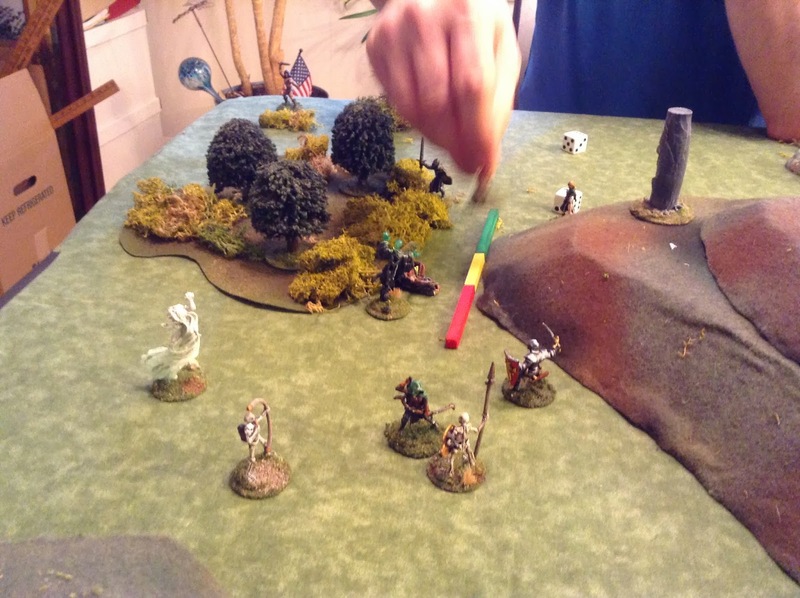 Rob chose a warband of assorted Human fighters, archers and a Magic User. He had one figure with the Leader ability in the mix, who effectively brought his warband’s Quality down to a 2+ (Lower Quality is better in SoBaH). It didn’t help things that I badly mishandled the warband from the get go. The Ghost proved to be useless with a Quality 4+ and a Combat of only 1. It seldom activated, and lingered about waiting to pile on to another combat, which never happened. I really didn’t know what to do with the Spectre either, with it’s Combat score of 2+. 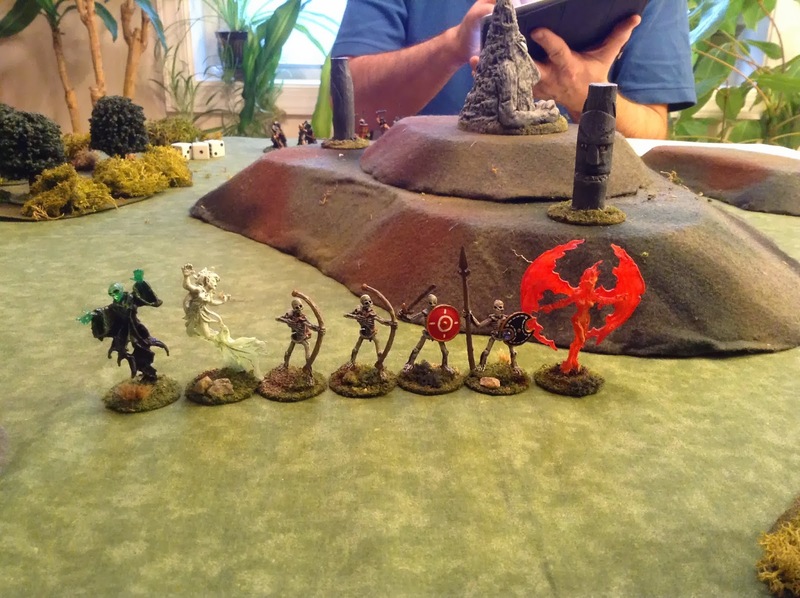 It wasn’t until halfway through the game that I realized the way I should be using it was to pin an enemy with one of my other units, and then charge it with the Spectre; thus forcing it to take a morale check (because of the Spectre’s Terror attribute) and possibly causing it to flee from combat giving the figure it was fighting a free, and lethal, hack. The Fire Elemental I sent on a foolish flank march to get at Rob’s wizard, but the hill slowed it down to a point where it had hardly got halfway across before the rest of my force had been decimated…which is what happened. While my Spectre and Ghost flounced around being ineffective with their Quality 4+ activations, Rob was able to efficiently start taking out my skeletons with melee attacks. When I did try to get my Spectre into combat it rolled miserably and lost the fight, falling to the ground. At which point it was swarmed and dispatched by the enemy. In a matter of a few turns I was reduced to below half strength, and we called it a game. My Spectre’s big chance. It knocks the enemy down, but subsequently has such poor activation rolls that the enemy is able to stand up and knock it down in return before it can react. Next up, I had prepared an Orc and Goblin warband. I was able to paint the Goblins up quick after the Spirit figure this past week, as the Spirit didn’t take that long, and I will feature them in an article on Monday. Rob reused his warband of Humans, and who could blame him after their great success in the first game. So this time I was tasked with defended the great Orc holy stone head alter from Human interlopers. This will be a short report, as I must say up front, I do not think I have ever had a game go bad for me so quickly. The Orcs, like my previous warband, suffered from less than average Quality of 4+. I had learned enough from Rob’s last outing with Orcs (See: Bones Battle Report ) to include a figure with the Leader attribute to effectively bring my Quality down to 3+ . So, on my first turn, I get about half of my stuff activated including an Orc Spearman who is pointed up as a Savage Orc. He gets two successful activation rolls and races forward. After my second mixed result activation, the Spearman is about a move out front, with everyone else following up at various stages. 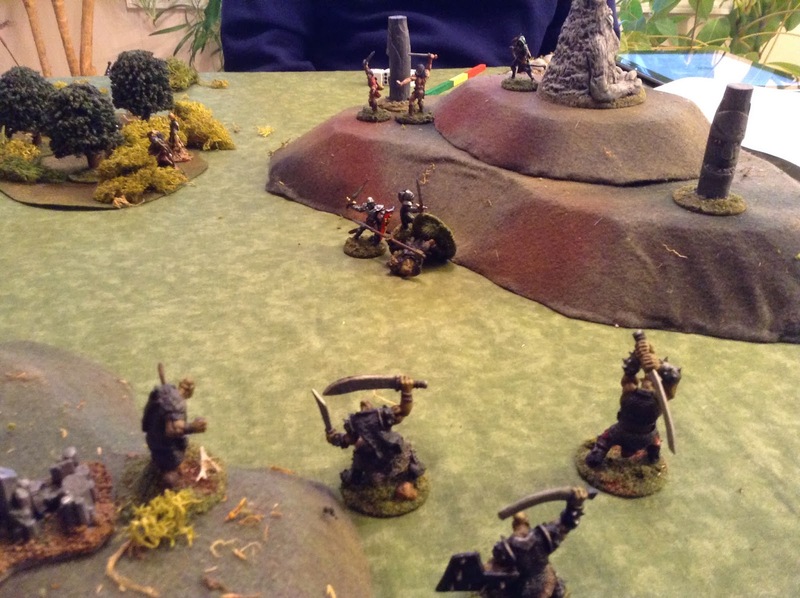 The beginning of the end: the Orc Spearman goes charging forth. At this point, two of Rob’s fighters who have also been racing forward, reach him. With their better Quality, they roll and get 3 activations each, so they still have the ability to strike the spear-wielding Orc when they get to him. The first one knocks him down, and the second manages to inflict a Gruesome Death on the poor Spear Orc. About 5 of my figures are in range to see this and must test morale. Since most have hardly got two moves onto the table, when they fail their morale they are close enough that the rout carries them off the edge. So, four end up running off the table. This immediately reduced my strength from the 10 models I started with down to 5 remaining by the third turn. Rob, easily enough, gets one more kill on me by plugging my archer with an arrow, which drops me below 50% strength. In the ensuing morale check, everyone else, but the swarms, run away. The end. The spear Orc meets a Grusome Death as his clanmates look on in horror, possibly wetting themselves and crying like babies, before running off the table. So, it was not a good day for my warbands. Rob and I discussed afterwards that we really need to figure out a way to make lower Quality and high quantity warbands work; since in the games we have played so far, the warbands that have the superior Quality always win. I look forward to our next rematch.